Camp Half-Blood. 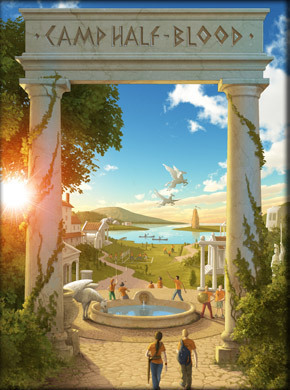 Official Camp Half-Blood picture as released door Disney Hyperion. Wallpaper and background images in the The Heroes of Olympus club tagged: the heroes of olympus the lost hero camp half-blood. This The Heroes of Olympus photo might contain straat, stad scène, stedelijke omgeving, stad straatbeeld, and stedelijke instellen. This picture was rleased on the new website, so I'm sure it is official. Isn't it weird that it looks like summer? Everyone is dressed for summer too, wouldn't it be at least a little chilly, even if Mr D does make the snow go away? Unless the story'll run until the following summer... YES! Isn't it sad seeing canoe's on the river, knowing that Percy isn't in them? :( I'd personally stay away from water bodies, especially those in the state of New York until Percy got found. Cause lets face it, Poseidon 'aint gonna be thriled. Well they do have orientational films... You can see the volleyball pit and eeryhting! I think its summer judging how those two dmeigods are walking in, not out of a fight or anything, so a pretty smooth entrance. ... I thought that pegasus was a swan. O.o Oh well, this picture was shown in one of the PJ&O books. I zoomed and the girl has something on her wrist. I don't think it's Piper, she does not wear jewellery. Hey, maybe its magic! I wish we can really go 2 Camp Half Blood. I live in Woodbridge and since Camp Half Blood is in Austin Texas, USA I cant register. Oh I wish I could go there!!!! @Aphroditeskid21 theres like a summer camp called camp half blood in texas. im not really sure on the details but i no they made it in texas. They made a identical camp in austin texas. I soo wanna go there!! Is it weird that I like to put "3.141 Farm Road, Long Island" for my address?